Collagen is the most abundant protein in animals which is found in skin & bones. Approximately 1/3 of the protein in the hunman body is collagen. Collagen plays a key role in providing the structural scaffold surrounding cells that helps to suppport the cell shape. Collagen mainly provides flexibility and forms strong structure for our skin, connective tissue, and bones. It has a strong tightly wound triple-helix molecular structure, so the strength of the collagen structure itself can be as strong as steel wire. contribute to such conditions as arthritis and musculo-skeletal injuries due to a lack of support for the joints. Fish Collagen  Type I is the most abundant of the many types of Collagen and are found in bones, tendons, skin and tissues. barrier into the bloodstream and carried throughout the body, leading to the collagen synthesis in the joint tissues, bones and skin dermis. 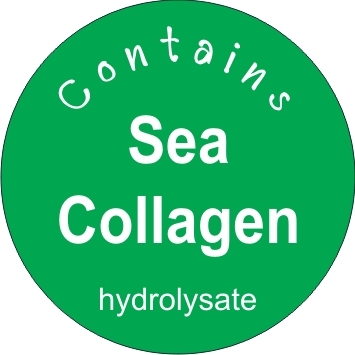 Hydrolyzed Collagen is the missing link in supplying amino acids like glycine, proline and lysine that are required by the body to build connective tissue to regulate cell growth. Pro-Hyp or Hyp-Gly stimulate cells in the skin, joints and bones, and leads to collagen synthesis through cell activation, suppression and growth. In particular, the amount of Hyp-containing peptide such as in the fish scale is significantly higher after ingestion than in any other form of collagen and can be detected in the blood. Collagen is one of the most important structural constituents in our bodies, representing 1/15 of our total body weight. This fiber-shaped protein plays an extremely important role in ensuring the cohesion, elasticity and regeneration of skin, bones, tendons, ligaments and skeletal muscles accounting for 25 to 30% of its total protein  75% of our skin is collagen. It is the key component for supple and radiant healthy skin. As we age, our body loses its ability to make collagen, thus, it starts to break down. This is why skin sags and wrinkles: hair becomes thinner, dull, or lifeless; joints are stiffer and less flexible; and bodies become softer and have less tone. Diet, age, stress, digestive system, &physical activity all affect our ability to provide the body with the nutritional raw materials it requires. Supplementing with collagen protein is believed to provide the body with the amino acids necessary to manufacture and support collagen in order to remain healthy and active. Histidine, Leucine, Phenylalanine, Theronine, Valine, Lysine." 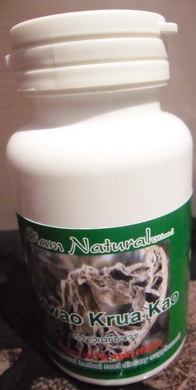 Pueraria mirifica is an indigenous Thai herbal medicine known in Thai as Kwao Krua (spelling in different ways: Kwao Kreu, Kwao Keur, Kwao Kruea) which is normally referred to white Kwao Krua or Kwao Krua Khao. The tuberous root of this plant, containing various phytoestrogens, has been used in folk medicine by Thai people for a long period of time as a rejuvenating agent and as the agent for inducing breast enlargement. Folklore goes on to say that the root is a fountain of youth for aged men and women. There are many reported on estrogenic properties in vitro and in vivo assay which exhibited estrogenic effects with metabolic activation of the KwaoKruaKhao plant and without adverse effects on animals and humans. Pueraria mirifica extract showed a biphasic response to MCF-7 cells with astrong binding with estrogen at high dose in competition with estrogen receptors. High concentrations of the plant extract had an anti-proliferation effect on HeLacancer cells. A tuberous plant contains large amounts of isoflavonoids, especially puerarin and daidzein. It is popular for consumption in the treatment of hypertension and alcoholism with antioxidant and has shown anti-dipsotropic activities. At present, Puerariamirifica is used as the main botanical ingredients in cosmetics and dietary supplement products. In particular, Pueraria mirifica Airy Shaw et Suvatabhandu (Leguminosae), which contains high amounts of isoflavones, has been extensively studied for its content, and estrogenic effects on reproductive organs and bones. Most in vivo studies evaluating the estrogenic effects of phytoestrogens in P. mirifica used rodents as experimental. A number of laboratories in the US and Europe have reported that commercially available rodent dietary formulations contain variable but significant levels of phytoestrogens, especially daidzein and genistein. The tuberous root of Puerariamirifica contains miroestrol and other various active principles, namely, deoxymiroestrol, daidzin, daidzein, genistin, genistein, puerarin, coumestrol, mirificoumestan, kwakhurin, mirificin and two steroids, estrone and estriol. Deoxymiroestrol was recently isolated and identified as the actual, most active phytoestrogen of the plant. Up to now, the plant material being used in most studies on Pueraria mirifica was either the dried powder or the alcohol extract. method and HPLC and TLC fingerprintsalso use for control a quality. W. Cherdshewasart, S. Subtang, W. Dahlan,. (2007).